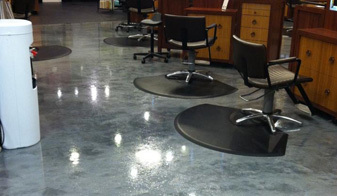 Decorative concrete finishes are the latest trend in flooring for boutiques, salons, showrooms, and other retail outlets. Small business owners have been looking for a low maintenance option to replace traditional tile, linoleum, and hardwood. Our seamless floors are easy to clean and nearly impossible to scratch or stain. We offer a diverse collection of finish options that can be customized to fit your decor. CGFC’s Decorative Polymer systems are perfect for customers looking for a modern, clean, and unique feel. Mica Blend floors create a beautiful metallic luster. Ultra Premium flooring options mimic the look of granite or terazzo while Premium systems provide a simpler effect.